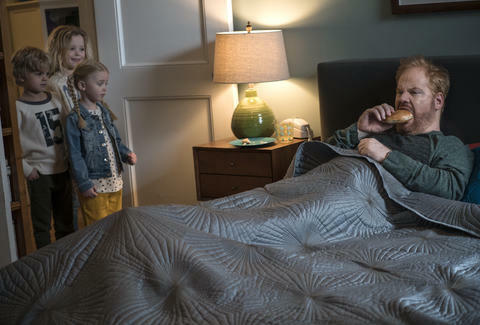 Comedian Jim Gaffigan’s latest project, The Jim Gaffigan Show, premiers Wednesday July 15th on TV Land. The show is a fictionalized account of his life off-stage, which involves empanadas, a steep cheeseburger graph, and culinary contributions to humanity like "The Gaffigan." We sat down with Jim to get his thoughts on eating right (no pasta made of bark). "I know some people are getting rid of bombs and minefields; I’m putting peanut butter in ice cream." "I would say I’m definitely a late-night snacker. I have a Youtube video about some of my late-night snacks. One of them is taking peanut butter and eating ice cream with peanut butter in it. That’s one of my inventions -- one of my contributions to mankind. 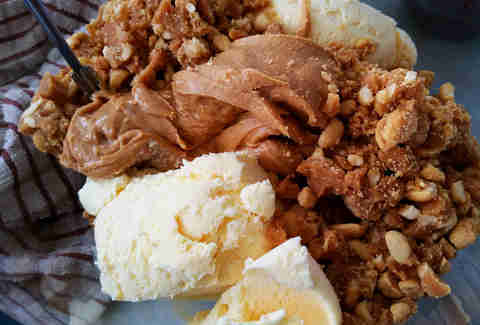 I know some people are getting rid of bombs and minefields; I’m putting peanut butter in ice cream. Which I think already happened, but I’m taking credit for it." Much of your late-night snacking takes place in bed. What food do you like to take to bed? "I like life-sized gummy bears. Food to bring into bed -- that’s a very important thing. Pretzels filled with peanut butter -- those are a good size, but very dry. Potato chips are good, as long as they’re not too dusty." What's the closest thing to a Hot Pocket that you actually eat? 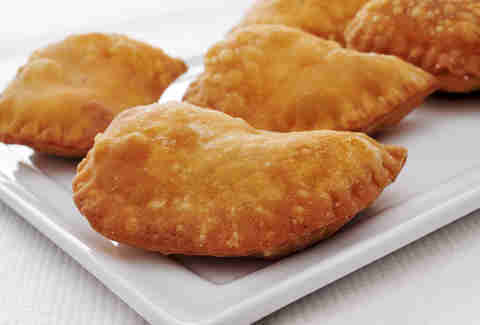 "I love empanadas and Jamaican meat pies. I’ve had some Jamaican meat pies that were made in another decade, sold when they shouldn’t be sold… The empanada is one of the most glorious, perfect things that South America has given us. And I say that because I’m Argentine." What's a cornerstone meal for you? "It varies, right? Wouldn’t you say that what you want for your next meal is informed by what you’ve recently eaten? I mean, I would say that if there was a graph of all the days I’ve eaten cheeseburgers, most of those days would be cheeseburgers." Are you a bad food influence on your kids, food-wise? "I’m a very negative force. So a lot of the special time I spend with my children is me going to a place and eating what I enjoy. 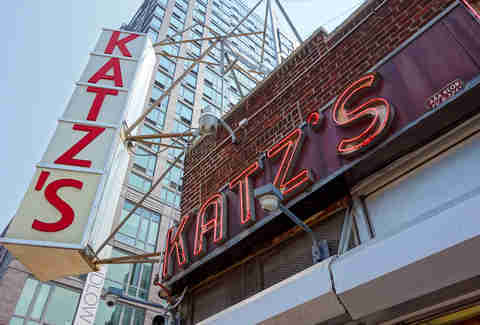 Some dads bring their sons to baseball games, I bring my son to Katz’s Deli to have some pastrami or to have some perogis. That kind of thing." So what's in the Gaffigan kitchen? "My wife is in charge of the food, so there’s the Whole Foods version of junk food -- that they’ve obviously over-charged her for -- that they will eat. So like KIND bars, whatever that is; my nine-year old consumes like 30 of those a day. But there’s a lot of hummus… it’s pretty healthy. It’s like pasta made of bark. Stuff like that." What's a typical dinnertime like in the Gaffigan household? "It’s very loud. There’s a certain witching hour where you’re like, 'We gotta put these kids to bed or… kill them.' So pasta is a big thing. Kids love pasta. Pizza is the national food of kids. But yeah, dinner is a little chaotic. The good thing about stand up is that I can eat with them, pretend to eat vegetables, and then later on I get something good. But I think it’s important to eat with your children. That's a time when I tell them, 'Use a fork. Stop stabbing your brother…' that kind of thing." "If you’re eating during The Walking Dead, you’re an eater. 'Oh that’s gross. I wish I had some ketchup.'" You're not a fan of cooking, but when you have to, what's your go-to dish? "I’ll occasionally do a concoction. 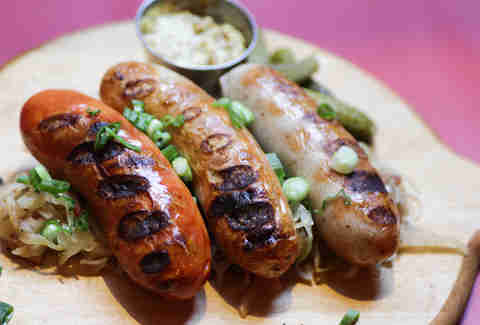 I make a good Bratwurst -- that’s essentially boiling a sausage in beer. I’m good at that." Speaking of beer, what's you beer-drinking style? "I’m a beer guy. I go through phases but I like, as my brothers would say, the fancy beer. So I love a Yuengling, I love a Brooklyn Lager. My brothers are more of the Miller Lite and the Bud." "I do find it weird to watch television and not eat. Even with Game of Thrones or The Walking Dead when I’m like, 'Oh my god I can’t believe how gross that is,' there’s a lot of eating. If you’re eating during The Walking Dead, you’re an eater. 'Oh that’s gross. I wish I had some ketchup.'" "You know what I think is really good? Really good? Say, next time you’re in a restaurant. You get a short stack, three pancakes. You get two fried eggs. 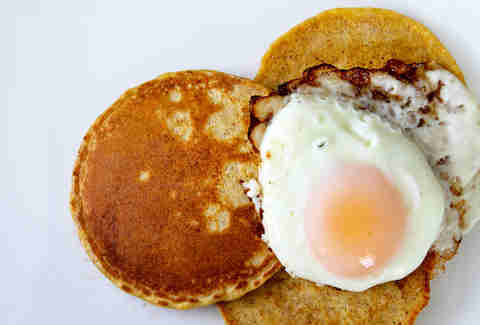 You put one egg in between, then one egg in between, butter on top, then you eat it. It’s the best. The. Best. I’m giving advice to everyone at home. It’s good. I think that’s called 'The Gaffigan.'"